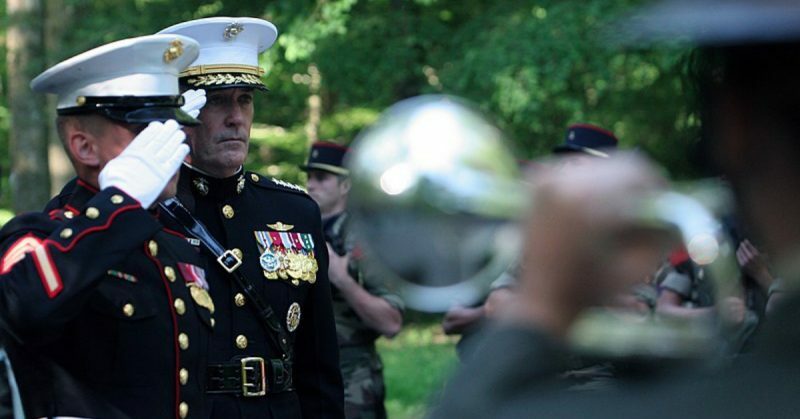 After laying a wreath in honor of the sacrifices made at Belleau during the First World War, Gen. Joseph Dunford, Assistant Commandant of the Marine Corps, salutes to the Marine memorial, “Iron Mike,” that is nestled on the sacred, historic battlefield of Belleau Wood. The Battle of Belleau Wood would mark a turning point as the American forces helped to stop the final German offense of WWI. June 6, 1918 is one of the bloodiest days in the history of the U.S. Marine Corps. 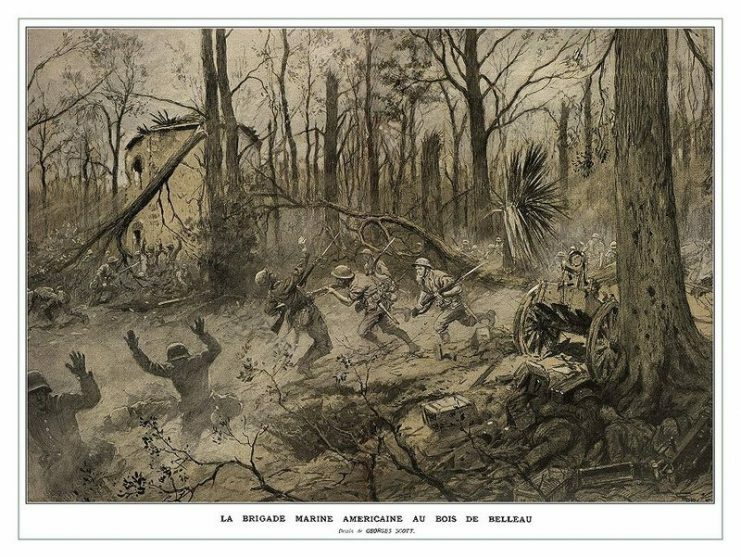 It was the first day of the Battle of Belleau Wood, which pitted the Marines against the German Army. It was also a day of extraordinary actions taken by Gunnery Sergeant Charles Hoffman. Hoffman’s actions on this day would place him on the list of double Medal of Honor recipients. This is a very short list of 19 military service members, and only five of those received medals for actions in WWI. The only strange thing about Hoffman’s award is that his name was not Charles Hoffman. Charles Hoffman was born Ernest August Janson on August 17, 1878. He served for 10 years in the U.S. Army as Ernest Janson prior to WWI. Then on June 14, 1910, he enlisted in the Marine Corps using the name Charles Hoffman. According to Patrick K. O’Donnell, author of The Unknowns, the name change was related to how Janson left the Army—he is believed to have gone absent without leave. To avoid this criminal offense being found out, he chose the name Charles Hoffman when enlisting with the Marine Corps. 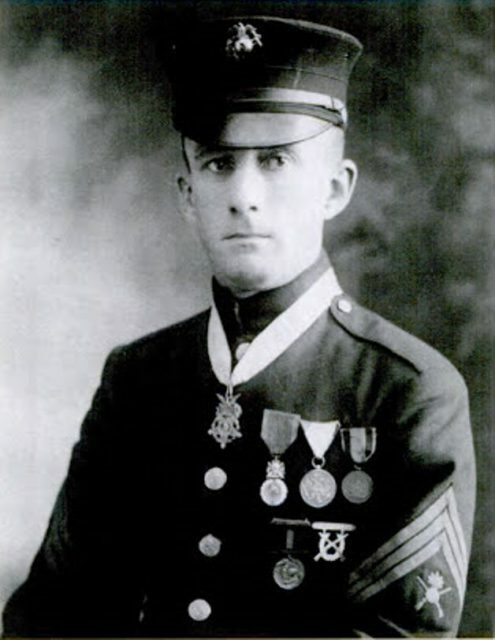 Gunnery Sergeant Ernest A. Janson – awarded the Army and Navy Medals of Honor in WWI. Here, Janson wears the Army Medal of Honor around his neck, the French Médaille militaire, the Montenegrin Medal for Military Bravery and the Nicaraguan Campaign Medal in the top row. As Charles Hoffman, he became a corporal before being honorably discharged on June 3, 1914. He enlisted for a second time a few days later and was assigned the rank of sergeant in August 1914 after the outbreak of WWI. During this enlistment, he served on a number of Navy vessels until May 1917. In June 1917 Janson sailed to France where he was advanced to gunnery sergeant. This appointment was temporary and would only last for the duration of the war. In France, he would be part of two Marine regiments that fought with the U.S. Army’s 2nd Division. This was the division which was sent to Belleau Wood in June 1918. The Battle of Belleau Wood would mark a turning point as the American forces helped to stop the final German offense of WWI. The initial offensive was stopped on June 1st. The 2nd Division, along with the Marines, were ordered onto the offensive at Belleau Wood, which they needed to clear of German forces. The German position in front of the wood was the primary target on June 6. The initial attack caused heavy losses for the Marines, and would be their highest battle casualties until the Battle of Tarawa in WWII. This initial attack did not bring the success that the forces wanted, so a subsequent attack was ordered. 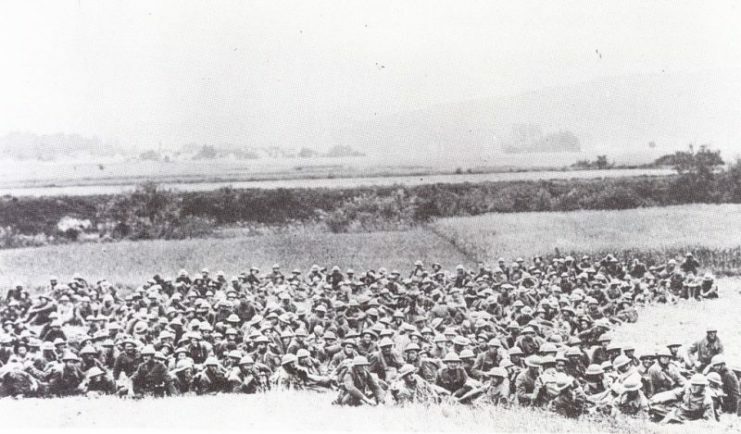 The Marine company Janson was in had been ordered to Hill 142 which they were able to reach. However, the German forces were not giving it up without a fight. They did not have troops in position on Hill 142, but they sent soldiers with light machine guns to take the hill back from the Americans. As Janson organized the defense of the hill, he noticed a dozen German soldiers coming their way. He raised the alarm with the rest of his company before rushing to meet the Germans. As he rushed to stop the attack, he killed two of the dozen German soldiers with his bayonet. The remaining soldiers fled and the counterattack on Hill 142 was stopped. 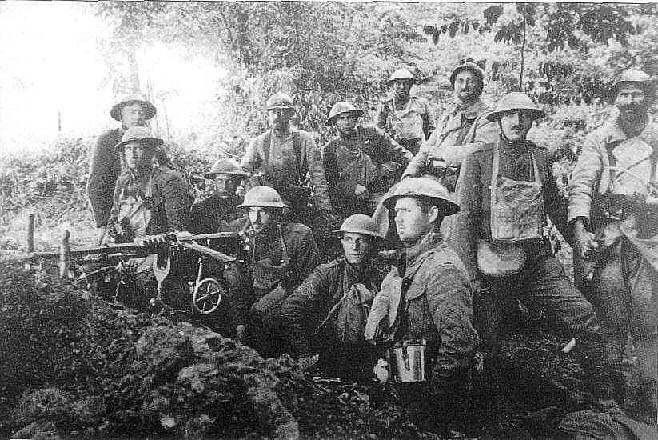 Members of the 77th Co, 6th Machine Gun Battalion & French poilus near Belleau Wood. The offensive against the Germans’ position continued until June 26th. It would take six attacks launched by the American forces to expel the Germans from the woods. During these attacks, Gunnery Sergeant Charles Hoffman was severely injured. The action he took on Hill 142 would be the reason why he was awarded the Medal of Honor. Ernest A. Janson wearing his Tiffany Cross Medal of Honor at the dedication of the Tomb of the Unknown Soldier, Washington DC, Nov 11,1921. However, Charles Hoffman received two Medals of Honor for the same action—one from the Army and one from the Navy. This was possible because the Marine Corps is part of the U.S. Navy, and Hoffman’s regiment was attached to an Army division during the battle. The rules have since changed so that that type of double Medal of Honor is no longer possible. The fighting ended, exhausted and seriously depleted ranks of the 6th Marines gather outside Belleau Wood before moving on. After the end of the war, Hoffman returned to the United States and received treatment for his wounds at the Naval Hospital in New York. At the end of his second enlistment, he was honorably discharged. However, he was not finished with the Marines and enlisted for a third and fourth time. Both of these enlistments would be spent as a recruiter in New York. In 1921, he changed his name back to Ernest Janson and was selected as one of the pallbearers for the Unknown Soldier. At the age of 49, he requested retirement from the Marine Corps. Before he retired, he was promoted to Sergeant Major and returned home to New York.